Small sheep, new sheep! When my siblings and I were small children, my mother – being the wise woman that she is – realized that a bit of strategizing was necessary to stage a successful Christmas tree. Since children are, by their natures, curious, and small children by theirs a bit grabby, it is unlikely that the ornaments on a Christmas tree will be left alone by little hands. Thus, the branches that could be reached by small, grabby children were hung with ornaments that were 1) not breakable and 2) not dangerous. I remember sturdy wooden ornaments, and ornaments made in school from things like walnuts and wooden spoons – and on the very lowest branches were always hung a largish stuffed Christmas tree and an equally largish stuffed candy cane. 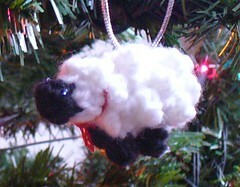 (These ornaments were always hung with loops rather than hooks, to avoid nasty pokings.) I’ve intended to make some unbreakable ornaments for over a year, and I finally got around to it this week. Behold the sheep! That’s right, sheep. Among my mother’s ornaments are a pair of sheep which, for some reason unbeknownst to me but (I’m sure) going far back into the earliest years of her childhood are especially special to my older sister. Who knows, perhaps they were the ornaments she was encouraged to touch as a toddler – the sheep are very sturdy with (I believe, if I recall correctly) a wooden core covered with something fleecy. Maybe actual fleece. I don’t know. I’ve always liked those sheep, too, and I had them in mind when I made these (although they really, really, really don’t look like it). And one of Big Sheep. The ornaments were intended for a swap earlier this week which I was, sadly, unable to attend. I don’t mind too much, though, as now I don’t have to make another set for myself. Max is pleased, too, that we have “oo-ite ga-ba” (translation: white baa-baa [sheep]) on our “een ee nites ah-NUH” (translation: green tree lights on [Christmas tree]). He is too cute. What’s that? Oh, you like my yarn loop stitch marker and safety pin holders, eh? Pshh. Crocheters have no need of these things. Use what ya got, baby! Bah Baa – Sheep for Christmas! This entry was posted in Finished, In Progress. Our cats were kind enough to ruin our delicate ornaments a year before we had Chunky. So nice of them to look out for the well being of our child. 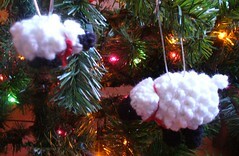 Ooooh, those are the cutest, fluffiest sheep that I have ever seen donned on a Christmas tree. 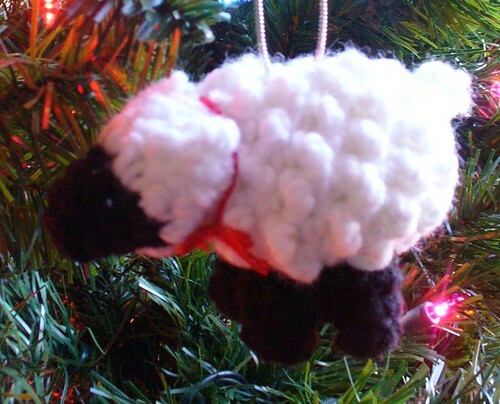 I would have never thought to put sheep on a tree but now that I’ve seen yours and how cute and child-friendly they are, I’m thinking that’s a really good idea. Did you come up with your pattern for them. 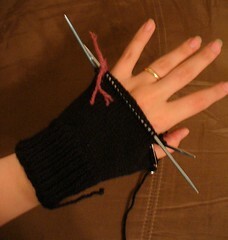 And your gloves are looking really nice, I especially love the beautiful stitch marker. I’m thinking I need to make some for myself. You are so talented!!! I love your little sheep! They’re just darling. Sounds like your little one is too — that’s such a nice age.